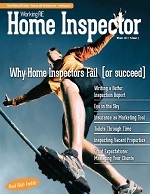 Do we all agree that 2009 has been a challenging year so far for home inspectors? Most home inspectors I have talked to have found that work levels and incomes continue to decline. During a recent ASHI Mid-Atlantic Chapter’s monthly “Candidate Education Hour,” which I moderated, we explored in depth what services some members currently offer that could be adopted by others to raise their income potential. Environmental testing was my first suggestion. I was thinking mold and radon and up selling services as opportunities present themselves. Our MAC-ASHI members, as usual, had a broader view. Why limit oneself to up selling when you could entertain a dual career, they asked? Although the ASHI Code of Ethics prohibits inspectors from performing repair work on the homes they inspect within one year of the inspection, there is no prohibition to marketing to previous clients after one year. Many experienced home inspectors have hundreds and even thousands of previous clients, so that potential market is both available and enormous. One inspector, worried about economic conditions, has started a non-related business, performing safety inspections in homes with expectant parents or young children. He makes the requisite safety alterations, such as installing safety fencing over older rails whose pickets are spaced more than four inches apart, childproofing cabinet doors and installing gates at the top of stairs. There are numerous other housing-related nontraditional “real estate transaction” inspection work opportunities available to home inspectors with construction skills and creative ways to use them.